What an exciting adventure! We were blessed with an opportunity to visit some new communities. The first of these communities is about an hour and a half drive southeast of Caspizapa. We were excited for this journey because we were going to see a new part of the jungle and it was our first overnight adventure. Taylor first visited with the animador in Alminrate Grau last month. This was a visit guided by the Holy Spirit. One day he was heading to Picota to talk with Padre Paco and four hours later he returned to tell me that we will be visiting some new communities on January 10th. After some more probing I was told that these communities only have the opportunity to receive mass once or twice a year. There was also one community that Taylor visited who had never been visited by the church. Taylor promised the people in Nuevo Control that we would also stop by to visit with them on our return home on January 11th. Preparing for an overnight visit is never easy for a family of eight. Especially when you have to pack enough water for two days. For communities further into the jungle drinking water is very precious. They buy the water in Picota and then drive it to their communities. In most pueblos along the Huallaga you can buy drinking water but in the communities we were preparing to visit you can not. Three camel baks and nine nalgene bottles later our water was packed into Groot, our missionary machine, aka our car. Not knowing what the people in these communities had we packed everything that we thought they might need. Two cases of Bibles; check, one giant bag of rosaries; check, prayer cards; check, catechesis books; check, Theology of the Body books; check, and song books; check. Next it was time to pack for us. One pack and play with a mosquito net for the girls, a wool blanket for a mattress, a couple of blankets, a mosquito net, swimming suits to bath in the river, a change of clothes for each of us and we were packed. Oh and FOOD! A bag full of food is necessary when traveling anywhere. It keeps everyone from getting hangry, hungry and angry, and it is always good to have food just in case you take an unexpected detour guided by the Holy Spirit. I have learned that this is a normal thing in our missionary life so I just assume that it is going to happen. 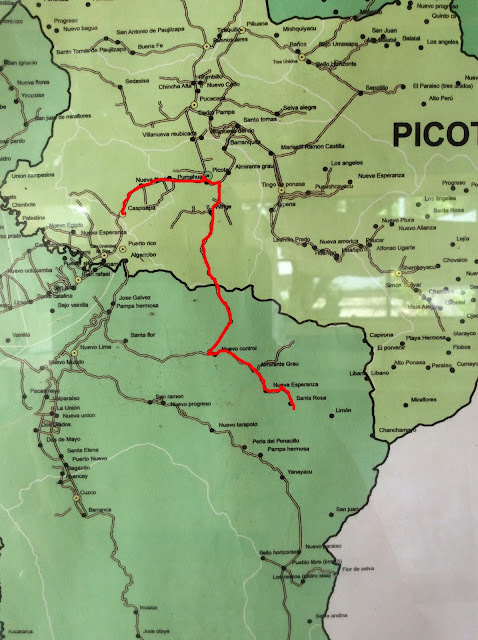 After cramming the eight of us into Groot we were off to Picota to top off our gas tank before heading to Alminrate Grau. We almost ran into a pickle in Picota. We pulled into the gas station to find out that they were out. Praise the Lord there is a second smaller gas station in town. We were able to top off the tank and away we went. The drive to Alminrate Grau was breathtaking. I am in constant awe of how beautiful this country is. With each new community we visit God's design is ever more beautiful than the last.